Hey everyone! 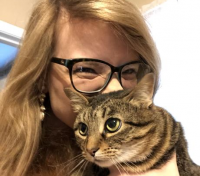 I’m Heather Beard and I’m a writer for Zelda Dungeon! I hail from the southern United States, in small town Mississippi, but I’m originally from Memphis, Tennessee; the home of some of the world’s best BBQ! I am a freelance graphic designer, photographer, and artist; my art often tends to be inspired by my love for video games, books, and anime! I am an avid reader, and I’m almost always reading something; be it manga, or re-reading Harry Potter for the thousandth time. I am married to my Zelda series loving husband, Justin, and we have a sassy, fat cat named Mandy-Lynn. For our first anniversary I created a wooden plaque with Link and Zelda on it, hand painted our wedding date in ancient Hylian, and lettered “It’s dangerous to go alone, let’s go together.” I like to think of us as a nerd power couple. In my spare time I enjoy baking, watching movies, and of course, playing video games. I’m also a cat lady, ‘nuff said. My favorite Zelda game is a hard choice, but The Wind Waker and Breath of the Wild hold dear places in my heart. The Wind Waker for being the game that my brother and I spent every week renting from Blockbuster until we beat it, and it’s the game that we bonded over; and Breath of the Wild for being the game that made me fall in love with the Zelda series all over again. I also enjoy all things Zelda lore! I’m a proud owner of The Goddess Collection, and Making A Champion. You can find me on Twitter and Instagram! I look forward to being a bigger part of the Zelda community! Daily Debate: Why Is The Legend Of Zelda Series Special To You? Daily Debate: If You Could Take Any One Thing From the Zelda Universe and Add It To Ours, What Would It Be? Daily Debate: Do You Think Zelda Will Ever Appear In A Game As Queen? Daily Debate: Should The Koroks Become A Major Species Like the Gorons and Zora? Daily Debate: Should Nintendo Pull a Majora’s Mask and Reuse Breath of the Wild Assets to Create a New Title/Sequel? Daily Debate: Is There A Best Zelda Game?